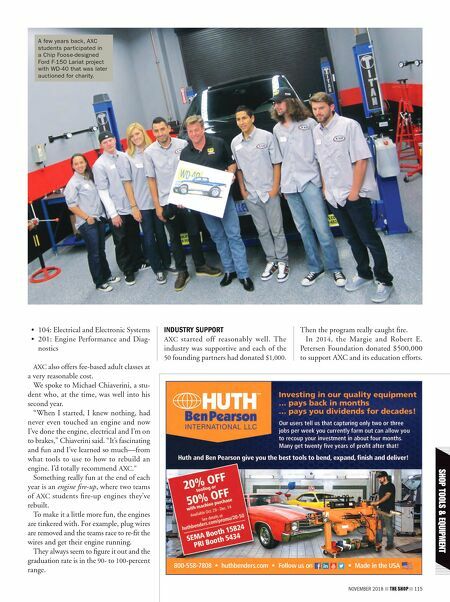 114 THE SHOP NOVEMBER 2018 I've written before about the Alex Xydias (pronounced X-hid- eous) Center for Automotive Arts at the Fairplex in Pomona, California. For those who don't know, Xydias, alive and kicking at 96, founded the So-Cal Speed Shop in 1946 and unwittingly built it into one of the most recognized industry brands around. It was re-launched by the late Pete Chapouris in 1997. The team garnered so much attention that in 2010, Fairplex —the Pomona, Cali- fornia home of the Grand National Road- ster Show and the L.A. Roadster Show— invited them to participate in its Career & Technical Education Center (CTEC) and established AXC. The Learning Centers at Fairplex help fulfill unmet needs by e d u c a t i n g a n d preparing students for real-world careers. Each year, more than 600 students study a r t s , m e d i a a n d design, agriculture, energy and utilities (such as water con- servation), hospitality and automotive tech- nology. To date, more than 350 students have been through the AXC program. PREPARING FOR A CAREER AXC's goal is to help young people, pri- marily high-school students, prepare for a career in the automotive industry. In what is now a two-year program, it presented its first graduating class in 2013. Students have to be attending high school, and they must graduate. Chapouris said at the time, "Acceptance is quite strict. We don't welcome any students that aren't com- mitted and we put them through an auto- motive boot camp. It's tough but it works." The cost of attending AXC is about $1,000 per year, but in most cases that is covered by a scholarship including some from the Saralee Baldwin pledge (Keith Baldwin worked for Xydias). Classes are small— usually no more than 12 students—and they are taught by ASE-certified industry professionals. Students have to find their own way to the Fairplex since there is no school bus. Once they arrive, the five streams are: • 101: Intro to Automotive • 102: Brakes & Systems • 103: Engine Repair AXC Gets a New Spark Welding pathway added to learning center's automotive course offerings. 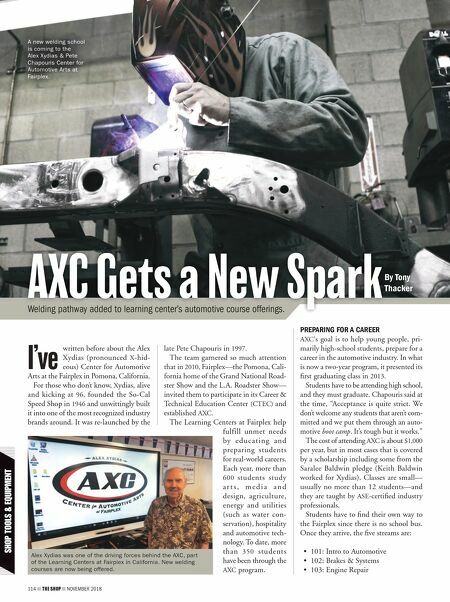 By Tony Thacker A new welding school is coming to the Alex Xydias & Pete Chapouris Center for Automotive Arts at Fairplex. Alex Xydias was one of the driving forces behind the AXC, part of the Learning Centers at Fairplex in California. New welding courses are now being offered.